If your business is involved in a legal dispute, you may voluntarily agree or be required to participate in mediation. Mediation is an alternative way of settling disputes that involves negotiation with support from a neutral third-party. Typically, mediation involves key decision makers from each party, as well as their legal counsel. The mediator begins by leading the parties through a confidential review of the situation at hand. Then, depending on the nature of the conflict, the mediator may place each party in separate rooms and act as a go-between to facilitate a jointly-agreeable resolution. Advocates for mediation argue that it creates cooperative resolutions, opens the door to more innovative solutions, and may even help preserve certain business relationships. 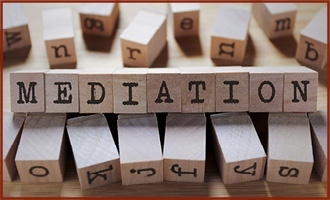 What’s more, mediation can provide significant costs savings over a lengthy litigation process. Consult your attorney about when to mediate. Ask your counsel to help you understand your opponent’s potential legal standing and to provide a cost estimate of taking the case forward through the court system. While entering mediation early in a conflict may save money, litigation is sometimes an essential part of the fact-finding process. Furthermore, litigation may reveal valuable information for (or against) your position. You and the opposing party may agree to enter mediation at any time in the legal process. The mediation process is non-binding, and if the parties cannot come to a resolution, your case may return to standard legal procedures. Mediation is distinct from arbitration, where an arbitrator reviews your case and makes a binding ruling. Actual resolution of legal issues depends upon many factors, including variations of fact and state laws. This article is not intended to provide legal advice on specific subjects, but rather to provide insight into legal developments and issues. The reader should always consult with legal counsel before taking any action on matters covered by this article. Nothing herein should be construed to create or offer the existence of any attorney-client relationship. Will Your Non-competition Agreement Stand Up to a Challenge?